Cause of his death was an infection of the heart and secondry peritonitis. Archibald was educated at Dr. Delafosse's School, Richmond Green, a school of high repute, ref. . In 1837, he entered St John's College Cambridge. took his B.A. 1841, M.A. 1847. Ordained Deacon by Kaye the Bishop of Lincoln in 1842, he was appointed Curate Collingham, Notts 1842-44; Ordained priest 1843. Archibald worked with Sir Henry Duckingfield at St Martins in the Fields ; then assistant Chaplain at Hampton Court and Curate of Teddington Middlesex 1844-46, and Chaplain at Hampton Court 1845-49; then Curate of Great Staughton, Hunts 1846, and from 1847 he was also domestic chaplain to Viscount Sidmouth. He was made Rector of Myland, Colchester 1850, but in 1855 he, and the then Rector of Southery Norfolk exchanged livings. Archibald took up his duties at Southery on 4 March 1855 and spent the remainder of his life in this village. Julius Jottings. January 1900. No 1. We give a few particulars of the life of the late Rev A. E. Julius. One of the most remarkable things is that he exactly completed his fortieth year as rector, having entered on the living of Southery on 4th March, 1855, and died the same day, 1895. In personal appearance he was about the average height, but had great strength, especially in his arms, which, no doubt, had been brought out in his school and college days, during which period he was much given to athletics as then practiced. He held the important post of Captain of the Lady Margaret Boat Club in St. John's College, Cambridge, at the time when that boat was head of the river. He was born (details as above of his early life & education as above) he removed to Hampton Court, and became Chaplain to the Palace there. Whilst occupying this position, he had three Queens on one occasion present at the service; Her Majesty Queen Victoria; Adelaide, the Queen Dowager; and the Queen of the Belgians. The Duke of Wellington was also a regular attendant. In 1850. Lady Cowper presented him to the living of Myland, Colchester, here he built a Church capable of holding 400 people. Finally the Rev Edmund Hall, who was then Rector of Southery, exchanged with him for Myland. On his arrival here, he had all the Church building to do over again. The Church was a most wretched barn-like structure, and Mr. Julius. who had been used to better things, could not put up with it, and at once began to look about him for ways and means, He was successful, and raised about L1,700 (see final cost below). With this sum, under the advice of Mr. Robinson, the architect, he built a far better church than could have been hoped for with the money at his disposal. It consists of a nice chancel, nave and south aisle, and holds 400 people. The carr-stone of the district was used with stone dressings, columns and windows in the Early English style. Mr Julius had several other livings offered to him, but he declined them. If his character is to be spoken of, I should sum it up in a very few words: he was a Churchman and an Englishman, very kind to all, and always ready to help anyone when it lay in his power to do so. Particulars submitted by Fanny Maria Hull (his daughter) the author is unknown. on the work thus begun. Minutes recorded notice of a meeting in the church, on the 6th Oct 1857 to consider a proposal to provide a new burial ground and build a new church in Southery. This meeting was held over to a further meeting on the 14th of October 1857 where the proposal, and a rate on Parishioners of 2/6d for 5years to finance it, was carried unanimously. 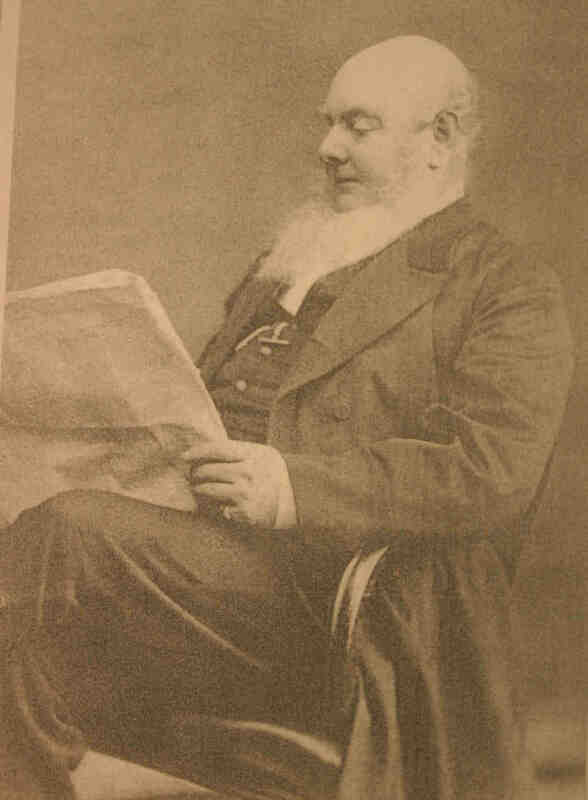 A committee was formed of the Clergy, Churchwardens (John Sayle & Frederick Robinson), and Mr Frederick Robinson Jnr., to give effect to the decision. The Foundation Stone was laid in 1858 and reads: " This stone as the Foundation Stone of the Church of St Mary Southery was laid by the Right Rev John Thomas the Lord Bishop of Norwich on the 7th day of September in the year of our Lord MDGGGLVIII (1858) in the presence of the Rev A E Julius MA Rector, Mr F Robinson and Mr J Sayle, Churchwardens and many others. With prayer to Almighty God for His Blessing on the work thus begun"
These were signed by the vestry and A E Julius as Chairman. Archibald last signed off Vestry minutes in the Church Wardens Books in 1892. The secretary of the Lady Margaret Boat Club [St. John's College Boat Club] gave me information she held about Archibald as a member of the club but unfortunately the minute books of the club for some years when he was a member, are lost. He was renowned in most of the Lent-May races at Cambridge during his time at the University. As regards the Colquhoun Sculls the secretary says "In 1837 a sculling Competition for the Colquhoun Sculls took place for the first time on the Thames from Westminster to Putney, organised by L.M.B.C. [In 1842 the venue was changed to Cambridge, where it still takes place]. He took the lead, but was overtaken by a Mr Bernay [? ], also L.M.B.C, and then Mr Shadwell [L.M.B.C.and Captain]. In the May Term 1840 Mr. Julius gets a mention in the Colquhoun Sculls, where he was beaten by Mr. Shadwell and capsized in the process. The list of captains is incomplete between 1839 - 1942 but it is likely that Mr. Julius was captain in part of this period. Julius Archibald Aeneas b.1818; educ St John's Coll. Cambridge, one of five members of College boat club who took part in the first race for Colquhoun sculls on the Cam 1837; rowed No. 2 in the college's first boat 1838 and 1839; B.A.1841, M.A.1847; ordained by Bishop of Lincoln, deacon 1842, priest 1844; C of Collingham near Newark 1842-5; C of Teddington, MDX 1845-9; Chaplain at Hampton Court Palace, preached once before three Queens, Victoria, Adelaide, and Queen of the Belgians; C of Great Staunton, Hunts, 1849-50; V of Myland near Colchester 1850-5; R of Southery, NFK 4 Mar 1855 to death. Died Southery rectory 4 March 1895. The Eagle June 1895 p 608. Death of Rev A.E. Julius. We regret to record the death of Rev. A.E.Julius who breathed his last at the Rectory on Monday. Although he had been convalescent for some time, it was not thought his end was so near until within a few hours of his death. The sad news caused a deep impression in and around the village. As recently as Sunday last he was in his usual good humour and chatted with his daughter and son-in-law, Mr and Mrs. T.J.Thompson of Peterborough who are staying at the rectory and even went so far as to remark to the Rev. V. W. Peake that he thought he should conduct a burial service on the following day [Monday] but fate willed otherwise. He retired to rest at his usual time on Sunday night when all went well until his housekeeper's attention was called to an unusual noise preceding from his bedroom. This was about 6 o'clock. She went to his assistance and found him in great pain. Dr. Todd, as the nearest medical man, was at once called in, and Dr. Mackintosh [of Downham] his regular physician, was telegraphed for, but on his arrival pronounced little hope for his patient. The news proved only too true, as death occurred a few hours afterwards. The primary cause of death was affection of the heart and secondary peritonitis. The Reverend gentleman was born 19th January 1819 and was therefore in his 76th year of age. He was the youngest son of Dr George Julius of the Palace Richmond, late physician to King George IV. He graduated at St John's College Cambridge where he was for many years Captain of Lady Mary Boat Club. His first curacy was at Collingham near Newark under the Rev Joseph Mayor, whose eldest daughter he afterwards married. He then became curate of St Martin in the Fields London and afterwards chaplain at Hampton Court Palace. His first living was Myland near Colchester, which was presented to him by Lady Cowper and for the last 40 years he had been Rector of Southery. On the formation of the first school board in the parish, Mr Julius was elected a member and the position he held for several years until he resigned. When the Institute and Library was first started, he became its President. An office he filled up to his death. He was the President of Southery Cricket Club and was a great admirer of the game. In his younger days he was as exceptionally good cricketer and up to the very last he never allowed a match by his village team to pass unnoticed, but he would support it both with his purse and presence. He was an exceptionally good preacher and was always sure of a good congregation. A short time after his death a great change must unavoidably take place at the rectory as at his decease, the living passes from the family. The coffin was of pure oak. There were many wreaths. Children Jack and Lucy Grandchildren of Oakleigh Park. Grandson Trevor Hull. In affectionate remembrance and true sympathy - Eve Sayle. Funeral Service by Rev Stephen Reed of Barton Bendish. Mourners: Mr & Mrs C. Hull, Mr & Mrs J. Clarke, Mr & Mrs J.T. Thompson, Miss Jecking Housekeeper and Servants. Also among other mourners Miss Sayle. Deceased interred in Family Vault in the churchyard. Ref: Downham Market Gazette 9 March 1895. The late Rector entered living on 4 March 1855 and died exactly 40 years later. In personal appearance he was about average height but had great strength especially in his arms - during school and college days much given to athletics. Captain of Lady Mary Boating Club before he left college there was an entry in the minute book of the club that when his boat went out of use, Mr Julius should have the rudder sent to him and about 30 years ago he received it as a memento off the proud position the eight oar occupied in his captaincy. Educated Richmond by Dr Dellafosse and afterwards with private tutors. Ordained by Kaye Bishop of Lincoln, having read for orders with Dr Oldnow. Mention of three Queens at Hampton Court Palace. 1850 to Myland, which he then exchanged for Southery with Rev Edmund Hall in 1855. On his arrival he had all the church building to do over again. The church was a most wretched barnlike structure and Mr Julius who was used to better things could not put up with it and at once began to look about him for ways and means. He was successful and raised L1700. With this sum, under the advice of Mr Robinson the architect he built a far better church than could have been hoped for with the money at his disposal. It consists of a nice chancel, nave and south aisle and holds 400 people. Consecration in 1858 when the village band played. Mr Julius gave the site for the church and also for a Sunday school. They had a large family, four sons and three daughters are still alive. The sons (one of whom is ordained) are in Australia but the daughters are settled in England. Mrs Julius died suddenly aged few years ago. Ref: Downham Market Gazette 16 March 1895. Julius Jottings No 3 October 1900. A choir screen of carved oak has recently been erected in Southery Church by members of the family in memory of the Reverend Archibald Julius, the late rector. Extracts: THE WILL of ARCHIBALD AENEAS JULIUS. Mention of settlement, dated 10th March 1847, made on marriage with late wife, Charlotte Mayor, eldest daughter of Rev Joseph Mayor, Rector of Collingham. To be paid from settlement L1,500 to daughter Lucy Adelaide Clark wife of J.L.Clark. Mentions also son Charles Archibald Julius, son Alfred Henry Julius, son Stanford Percy Julius, Daughter Fanny Marie Hull wife of E.C.P.Hull, Daughter in law Alice Julius wife of son Arthur Cowper Julius, grandson Ford Clark. Mentions also china basket given to late wife by late Lady Palmerston, Chippendale chairs, portrait of late Chief Justice Willis, covered oak armchair formerly belonging to one of the Earls of Warwick. Witnesses. Harold Archer Solicitor Ely and his Clerk. Probate London 2 July 1895. Estate L1,027 12s 1d . JULIUS Reverend Archibald Aeneas of Southery rectory near Downham Markets, Norfolk. Clerk died 4th March 1895. Probate London 2nd July 1895 to Edmund Charles Pendleton Hull and John Lockie Clarke Gentleman. Owners of Land 1873: Julius Rev. A.E. Southery 107 acres 18 perches. I shall be glad to hear what you think of this plan as soon as you can; also can you let me know where and what Arthur is doing, and if he is still living with that woman, why does Alice not get a divorce? He will if possible keep a hold upon her I cannot possibly send her any money at present as every thing is very bad in the old country at present my living this year is only L.311 and next year L.95 it will be still less; dear old Jane sends her fond love to "her boy" and all your party. Letter to Stanford Percy Julius from his brother-in-law, E.C.P. Hull concerning the above. See Archibald's estate accounts on pictures file. 2. Census: England, 30 Mar 1851, High Rd Mile End Colchester ESS. Archibald is recorded as head of house aged 30 married Rector of Myland born SRY Also in the house was Emma Boucher aged 36 born Bramfield Herts. 5. Census: England, 3 Apr 1881, The Rectory Church St Southery. Archibald is recorded as aged 62 head of house born Richmond SRY. Also in the house were four servants. 7. Archibald Eneas Julius: Will, 13 Sep 1894. ON the 2nd day of July 1895 Probate of this Will was granted to Edmund Charles Pendleton Hull and John Lockie Clark the Executors.